Idle No More is an ongoing protest movement originating among the Aboriginal peoples in Canada comprising the First Nations, Metis and Inuit peoples and their non-Aboriginal supporters in Canada, and to a lesser extent, internationally. It has consisted of a number of political actions worldwide, inspired in part by the hunger strike of Attawapiskat Chief Theresa Spence and further coordinated via social media. A reaction to alleged abuses of indigenous treaty rights by the current federal government, the movement takes particular issue with the recent omnibus bill Bill C-45. The Vision […] revolves around Indigenous Ways of Knowing rooted in Indigenous Sovereignty to protect water, air, land and all creation for future generations.The Conservative government bills beginning with Bill C-45 threaten Treaties and this Indigenous Vision of Sovereignty. The Goal of the movement is education and the revitalization of Indigenous peoples through Awareness and Empowerment. IDLE NO MORE has successfully encouraged knowledge sharing of Indigenous Sovereignty and Environmental Protections. The press release also states: “As a grassroots movement, clearly no political organization speaks for Idle No More”. 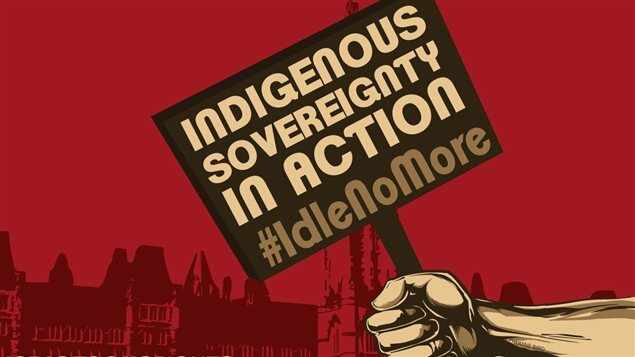 Idle No More’s vision has been linked by some commentators in the press with longstanding leftist political theories of indigenism. During the protests of late 2012 and early 2013, the theoretical framework of Idle No More has been frequently articulated in the Canadian press by Pamela Palmater. Palmater has denounced what she perceives as the federal government’s “assimilationist agenda”.It has been pointed out by others that the definition of “nation” is itself problematic. Sylvia McAdam, a co-founder of the movement, has stated that she does not condone the rail or road blockade tactics that some demonstrators have used, but has spoken in support of peaceful protest “within the legal boundaries”. The movement was initiated by activists Nina Wilson, Sheelah Mclean, Sylvia McAdam and Jessica Gordon in November 2012, during ateach-in at Station 20 West in Saskatoon called “Idle No More”, held in response to the Harper government‘s introduction of Bill C-45. C-45 is a large omnibus bill implementing numerous measures, many of which activists claim weaken environmental protection laws. In particular, laws protecting all of the country’s navigable waterways were limited in scope to protect only a few waterways of practical importance for navigation. Many of the affected waterways pass through land reserved to First Nations. This led to a series of teach-ins, rallies and protests that were planned by the founders in a National Day Of Action on Dec. 10th which coincided with Amnesty Internationals Human Rights Day.These coincided with similar protests already underway in British Columbia over the Northern Gateway and Pacific Trails pipelines. The protests were timed to coincide with the announcement that Chief Theresa Spence of Attawapiskat was launching a hunger strike (no solid foods, limited to tea, water and broth) to demand a meeting with Prime Minister Harper and the Governor General of Canada to discuss Aboriginal rights. The Assembly of First Nations then issued an open letter 16 December to Governor General David Johnston, calling for a meeting to discuss Spence’s demands. Edmonton Activist Shannon Houle donated a blog and volunteered her time on the blog which became a much needed central resource for people wanting to connect with the visions and goals of Idle No More. As of January 4, 2013, the main goals have been narrowed down to (1) the establishment of a Nation to Nation relationship between First Nations and the Government of Canada, rather than a relationship as defined in the Indian Act to address issues and (2) social and environmental sustainability. The protests have also spread outside of Canada. On 27 December an online source reported that there had been 30 protests in the United States, and solidarity protests in Stockholm, Sweden, London, UK, Berlin, Germany, Auckland, New Zealand, and Cairo, Egypt. On 30 December, approximately 100 people from Walpole Island marched to Algonac, Michigan. CBS reported that “hundreds” attended a flash mob at the Mall of America in Minneapolis, Minnesota. 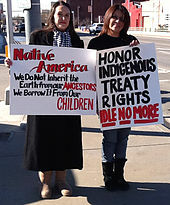 The Twin Cities Daily Planet called it a crowd of “over a thousand” and stated that it followed another similar protest week earlier where Clyde Bellecourt was arrested, and another flash mob at the Paul Bunyan Mall in Bemidji.On January 5th, the International Bridge was closed again from Mohawk protests from New York.